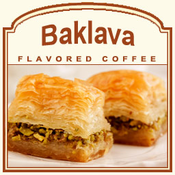 If you love the Middle Eastern classic dessert known as Baklava, let the Baklava flavored coffee tantalize your taste buds with its fusion of smooth honey, sweet maple walnuts, buttery undertones, and a toasted pistachio flavor. Made with 100% Arabica beans, this famous pastry dessert is captured perfectly with its unique flavoring that will satisfy your nutty cravings. With only 2 calories in each cup, you can indulge in Baklava as much as you want. Roasted and shipped on the same day, you can expect this Baklava flavored coffee in a heat-sealed valve bag that will ensure the freshest coffee possible. Perfect for those that like their coffee to stand out amongst the crowd, the Baklava flavored coffee will hit the spot with its smooth, creamy pastry inspiration.